For the Canadian politician, see Allan Williams (politician). Allan Richard Williams (born 17 March 1930) is a former businessman and promoter and the original booking agent and first manager of The Beatles. He personally drove the van to take the young band to Hamburg, Germany in 1960, where they gained the vital show business experience that led to their emergence on the world stage. Williams is the son of Richard Edward Williams, a local council building inspector and Annie Cheetham, tracing part of his ancestry back to Owen Williams (Owain Gwyrfai), a Caernarfonshire millwright, poet and pioneer lexicographer in the Welsh language. His mother died when he was very young and his father remarried to Millie Twigg, the family living in Litherland and being completed by Williams' half-sister Olwyn b. 1937 and half-brother Graham b. 1938. In his mid teens he left home to sing with Joe Loss in the Isle of Man. Later he sang with the D'Oyly Carte Opera Company and even tried to sell Blackpool rock in Spain. In 1958 Williams leased a former watch-repair shop at 21 Slater Street, Liverpool, which he converted into a coffee bar. He named the venue the Jacaranda, after an exotic species of ornamental flowering tree, jacaranda mimosifolia. The Jac (as it became known) opened in September 1958. The Beatles were frequent customers, with John Lennon and Stuart Sutcliffe attending Liverpool Art College nearby and Paul McCartney being at Liverpool Institute adjacent to the college. Asking for the chance to play the club, Williams instead put them to work redecorating, with Lennon and Sutcliffe painting a mural for the Ladies room. Finally, the Beatles began playing at the Jac on occasions. Between May and August 1960, Williams secured a number of bookings for the group at other places. One was backing a local stripper, named Janice; when she discovered the Beatles were not familiar with the "Gypsy Fire Dance", they instead backed her with a rendition of the Harry Lime theme tune. Williams gives an excellent and extended interview in the 1980 documentary, "The Compleat Beatles", in which he tells the story of preparing the group for their Hamburg venture. He recounts having to reassure Howie Casey, leader of The Seniors who were already established in Hamburg, who had cautioned Allan: "Listen, we've got a good thing going here in Hamburg. But if you send that bum group, the Beatles, you're going to louse it up for all of us." He also recalls auditioning drummer Pete Best, asking him to do a drum roll, which he did "Not too cleverly"...but good enough. Years later, Williams and The Beatles spoke fondly of one another, with McCartney describing Williams in The Beatles Anthology as 'a great guy'. In the 1970s, Williams played a crucial role in producing the first Beatles conventions to be staged in Liverpool, and he is a perennial VIP guest at the city's annual Beatle Week Festivals. In 1975, he published a memoir, The Man Who Gave The Beatles Away, to which Lennon gave his endorsement. Recovering a tape of a latter-day Beatles show in Hamburg (performing on New Year's Eve of 1962–63), he saw it released (in 1977) as Live! at the Star-Club in Hamburg, Germany; 1962. In 1999 the micro budget film All Those Years ago was released by Shotmaker Productions. The film is largely based on Allan's own recollections of his time managing the fledgling Beatles. Although initially flattered and sympathetic to the film, in his second book A Fool on the Hill, Williams described the film makers as being deceitful and the film as "utter rubbish" The Man Who Gave The Beatles Away is also the title of a musical by Irish playwright Ronan Wilmot, which was performed at the New Theatre in Dublin in 2002. Until recently, Williams carried on speaking at Beatles conventions from Liverpool to Singapore and South America. 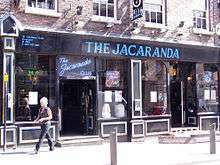 The Jacaranda reopened under new management in the mid-1990s and saw success build upon its cult status throughout the following decade; it was a popular venue for young and old lovers of live music and hosted many gigs for Liverpool's Sound City music festival. In 2012 French comics Gihef and Vanders published Liverfool (Emmanuel Proust Editions) in which they relate Allan Williams' encounter with the "Fab Four" and their first steps together. Allan Williams married Beryl Chang in 1955 and they have two children. ↑ "Meet Allan Williams, "The Bootle Buck"". Liddypol. Retrieved 8 October 2008. ↑ "Family tree on Ancestry.co.uk". ↑ "The Jac Is Back". ↑ McCartney, Paul. "A Little Bare". Bill Harry/Mersey Beat Ltd. Retrieved 10 June 2009. ↑ "The Man Who Gave The Beatles Away". ↑ "Liverfool par Gihef et Vanders".